« Congratulations Shinji — #1 Swimmer on Youtube! Working on this post has brought me the greatest happiness of anything I’ve written in the 23 years of TI. (The first-ever TI Adult Swim Camp, at Colgate University, began June 17, 1989!) After Shinji became the ‘most popular swimmer’ on-line earlier this week, I felt it was important to share his story–to let his many fans know something about the person who swims with such inspirational beauty. But also because the real story of TI is about using swimming practice as a vehicle for self-realization. Michael Phelps became the world’s most recognized swimmer-as-athlete in the world with expert guidance from Bob Bowman, often called the world’s best swim coach. Shinji is not only the most recognized swimmer-as-artist; as you’ll read here, he’s also the worlds #1 Self-Coached Swimmer and an embodiment of the philosophy of Kaizen. As he puts it “I still am just a middle-aged average swimmer who tries to improve every day.” His example is as inspiring as his form. Note: The photos below of Terry (L) and Shinji (R) were shot at a TI Open Water Camp in Eleuthera two months before his video went live on Youtube. 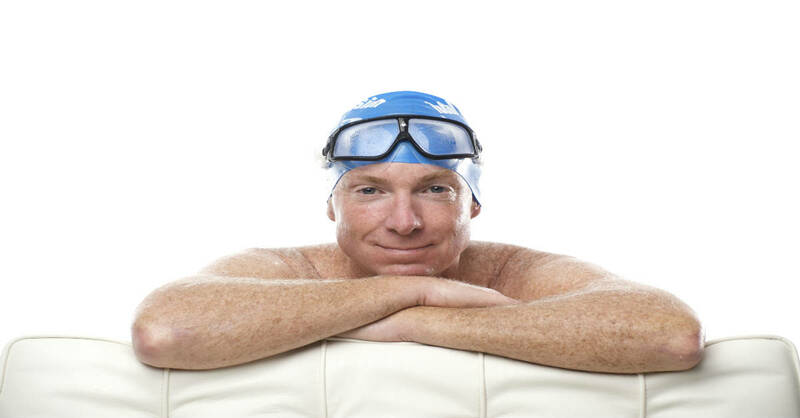 Terry: Why did you begin swimming and how did you find your way to Total Immersion? Shinji: In 2002, when I was 37, I wasn’t getting any exercise and had gained so much weight that my doctor warned me I needed to exercise. I had learned to swim in elementary school, as most Japanese children do, so I decided to swim for weight loss. But I got tired so quickly that I didn’t think I’d be able to lose weight.. Because I could swim breaststroke longer than freestyle I searched on-line for a breaststroke technique video. I noticed a Total Immersion video featured both breaststroke and butterfly. I thought two strokes for the price of one was a good deal. That was how I found TI. I’d never even visited the TI web site at the time. Terry: How did you make the leap from just swimming for weight-loss to introducing TI to Japan? Shinji: I started learning the breaststroke drills on the DVD. I wondered how practicing balance, without any pulling or kicking, would help me swim better. But within a month both breaststroke and butterfly felt much easier and smoother. Plus, as an engineer, I also appreciated the logic of TI. Finally, because I was excited at improving so quickly, I swam more often, and lost 18 pounds. All that from just a $40 video. It was the best money I ever spent. So I moved on to freestyle–and a whole new set of balance drills. It seemed like I was swallowing a quart of pool water while trying to do them, but I was now a True Believer in Balance, so I kept working on those drills. After two months, people began to compliment me on my freestyle. Next I tested the method by trying to teach a friend. The buddy-system steps on the Freestyle Made Easy DVD made teaching really easy. At our first meeting, my friend couldn’t swim 25 yards. After our fourth lesson, he was able to swim 40 minutes nonstop. I knew TI was good, but I never dreamed it was this good. So in 2004 I decided to attend TI Coach Training so I could introduce TI to Japan. Terry: Please describe the process you followed to develop such extraordinary grace? Shinji: I built my first Swim Studio in Chiba [a prefecture near Tokyo] where my parents live and I have an apartment. I installed an Endless Pool equipped with four cameras to capture underwater and surface video. I began to regularly video my swim, looking for errors I could fix. In addition to comparing my video to TI DVDs, teaching others was a big help in mastering the technique. Since TI Japan emphasized swimming with grace, I made it my goal to become the “most graceful swimmer in the world.” Whenever I was in Japan I spent 3 to 4 hours in the Endless Pool. usually from 10PM to 2AM, four days a week, recording my swim, analyzing it frame by frame, finding and fixing small flaws, one by one. When I practiced in a lap pool, instead of the Endless Pool, I would start with at least 30 minutes practicing drills. I enjoy practicing drills so much because I can feel much subtler things. Then I would move on to whole stroke practice–at that time, a combination of Focal Points and stroke counting. I followed the same skills progression we teach all TI students: Balance –> Streamline –> Propulsion. It took me a year to be satisfied with my balance, another year for streamlining skills, and two years for coordination and propulsion. I still feel I am improving all three elements, but now I use those improvements to swim faster, not just more gracefully. Terry: Now that Youtube viewers have ‘voted’ you the most graceful swimmer in the world, what are your new Kaizen goals? Shinji: Some people say you can’t swim with grace and do fast times, so I now focus on swimming faster with grace. Graceful swimming allowed me to swim any distance with fewer strokes. I use a Tempo Trainer to train my nervous system to adapt to faster tempos, without sacrificing efficiency. The point is sustainability–not just to swim faster, but to be able to do it longer. Terry: You’ve lived in the US for about half your life now but still teach TI frequently in both Japan and the US. What differences do you see in TI swimmers in Japan vs. the US. What similarities? Shinji: In Japan, more than 80% of TI swimmers are fitness swimmers, so they’re excited to swim with ease and grace. In the US, 70% of TI swimmers are triathletes. They want to swim more efficiently, but faster too. TI swimmers in Japan and the US may pursue different goals but they do it the same way. They strive to swim like me. They pursue that goal the same way I did — by following the logic and fundamentals Terry teaches. And both groups use drills and focal points. Also, people in both Japan and the US enjoy swimming for improvement, not just fitness. Terry: I find it remarkably visionary that you set a goal to become the “#1 graceful swimmer in the world.” I doubt anyone before you had even conceived of that as a category worthy of being recognized; and now you’ve set the bar so high I wonder if anyone will try to challenge you. How did you conceive that Youtube views would be the right measure for that goal? Shinji: Thank you very much. It is really an honor to have such a compliment from my sensei. I agree–unlike speed, there is no exact way to measure grace. But I did think you could define graceful swimming as “the way the greatest number of people hope to swim.” By that definition, the number of views should be a good measure. I believe people watch my swim because they want to swim as I do. My main purpose was to inspire more people to believe they could achieve such a goal. That is why I did not include any technical information. I hoped when people watch my video, they would mentally put themselves in my place and imagine how that might feel. Terry: When you decided to produce the video did you imagine you would one day outrank Michael Phelps? Shinji: Skyfit, the pool where we operate TI programs in Tokyo, was opened in Summer 2007, and we shot the video just before the opening. My intention was to promote TI in Japan by posting the video on the TI-Japan web site. I was not sure if people outside Japan would appreciate graceful swimming, but I decided to post it on YouTube in English in hopes of getting people outside Japan to comment. I had no idea I would one day draw so many views and outrank Phelps. I still am just a middle-aged average swimmer who tries to improve every day. I have watched Shinji’s video dozens of times myself and it is the first video I send to students, together with the one in Guam. All my sincere congratulations, this is great, and a tribute to your work and to TI. This is story is really inspiring for myself. I started to learn to swim at 36 (now i am 38). At same point i started on my own, later tried some lessons. It was not really successful by the way. The real breakthrough for my understanding of swimming basics was a book i had read: “Extraordinary Swimming for Every Body”. So I finally met the TI and i return to it every time when looking for useful tips. Wish you all success and keep inspiring others!! There is a wonderful TI coach in Annapolis Maryland-her name is Traci McNeil. Her website is crossingcurrentsaquatics.com. I highly recommend her!!! What a wonderful inspiration to thousands of people including myself. Shinji has become my inspiration in my quest to become a better, faster and more graceful swimmer…thank you! One of my students led me to this page and I must say I am impressed by the beauty of this swimming. I have wanted to write about what I think is the Zen of swimming which I’d my idea of dance, yoga and swimming mixed together. You both demonstrate comfort in your swimming and rhythm. I am member of US Master Swimming. In all of my younger adult years I was teaching Red Cross and YMCA certified swimming and coaching to all ages; as well as teaching emotionally and physically challenged people of all ages. As a Director of a Metropolitan County YMCA and programs for a season of time; as well as the swimming program for all ages and levels of skills for some years, swimming will always forever be a huge part of who I am and where I must return. I have had a series of surgeries for feet, knees, new stomach opening and now the last being a stenosis correction. Other than those surgeries in the last several years and a few others years ago, my internal “life necessary” functioning organs and muscle tone are in great shape. My husband and I have been a health food and excecise advocate. It all began when I was 34 years old. At this last surgery intake, the nurse spun her head around to look at me again with wide eyes. She said she was shocked to find out I was 79 and without the computer recorded age she said she would have guess that I was 60. Wow, that made me feel really great and I get that comment very often, so thank goodness for my 34 year old decision and an awesome husband. I will be fully able to go back to swimming in October or November of this year. It will be time to go to coaching and any update classes for new ideas that have been discovered during my absence from swimming. These techniques you are showing sound wonderfully awesome for all swimming disciplines and age related goals. It also looks like an awesome way to entice people who have been away from swimming for too long and desire to return with reluctance; as well as people who have parts of their bodies that are handicapped and need some adapting. Peaceful relaxation and not swimming with fear which always makes the body stiffen up and heavier. It is sad to watch people swim with fear and like they are swimming to get away from something frightening and chasing them. Swimming should always start with this kind of stroking and then some adaptions made if the goal is to win a race. I would appreciate being able to purchase all of the DVD’s, so that I can study them in depth, practice them myself and then teach them to all ages for swim teams, as well as for recreational and theraputic needs for all ages, as well as physicalyl handicapped issues. Please I would so appreciate a response to know where I can purchase the entire group of any produced DVD discs, as well as the price of purchase. Best regards and thank you for hopefully responding to this message. Martha This is such uplifting comment. Thank you for following the blog. I hope you have checked out my latest too — A Primer on Stroke Drills. It’s the first of a series on the topic.